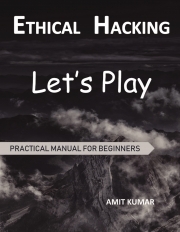 Description of "ETHICAL HACKING Let's Play"
Start learning Ethical Hacking right from the Beginning with easy to follow Walkthrough. A Straightforward, easy to understand, 17 chapters practical manual covers vast range of topics, right from setting up lab environment to techniques and methods for reconnaisance, scanning and hacking into System,Network,Webserver, Web applicaiton, Mobile, WiFi and so on. Including topics like Privilege Escalation,Pivoting, Malware creation, Session hijacking, shell shock, Blind Sql Injection, XXE, Clikcjacking, Phishing, Android app pentesting, Rouge access point, Cryptography and many more. Each and every topic from starting explained with practical and at the end gives you hands on experience of real time pentesting scenario by compromising multiple target machine using different hacking methods and techniques. The Purpose of this book is to teach the hacking methods and technique in practical way for performing ethical hacking or penetration testing. Reviews of "ETHICAL HACKING Let's Play"